Your tooth starts throbbing. Your child says she has pain when she brushes her teeth. Causes of tooth pain vary. 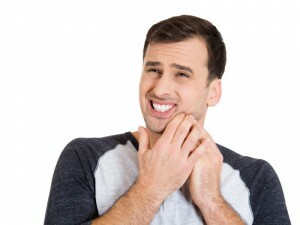 Your Topeka/Silver Lake dentist, Michael E. Michel DDS, uncovers reasons behind tooth pain and relieves it so patients chew, bite, speak and smile in perfect health. The Academy of General Dentistry says as many as 40 million American adults experience tooth sensitivity, the most common kind of dental discomfort. It happens when fluid moves against the nerves in a tooth’s soft inner pulp. In fact, young people between the ages of 25 and 30 have quite a bit of dental sensitivity, but it is benign and part of natural development. If you have a toothache or extreme sensitivity, come to Michel Dental where Dr. Michael E. Michel and his team will uncover the cause and take the proper steps to treat it. Through oral examination, digital x-rays and other modern diagnostic techniques, Dr. MIchel advises ways to restore oral health and alleviate discomfort. Your Topeka/Silver Lake general dentist remedies sensitivity related to wear and tear with fluoride treatments, sensitivity toothpastes or plastic sealants. These interventions protect tooth enamel from extremes of hot and cold and sugar/carb sensitivity which “blasts” tubules in tooth dentin and the innervated pulp in root canals. Bruxism and TMJ issues respond well to customized acrylic mouthguards. Worn at night, these appliances realign and cushion upper and lower teeth. Of course, dental decay, fractures, avulsed (knocked out) teeth and painful abscesses need immediate intervention in the way of tooth-colored fillings, porcelain crowns, root canal therapy and other restorative procedures as needed. Dr. Michel is highly skilled in restorative dentistry, including modern dental implants restorations and especially, popular mini-implant/denture combinations. When you have dental pain of any kind, do not diagnose yourself. Contact Michel Dental for a one on one consultation with your Topeka/Silver Lake emergency dentist. Your comfort and health are his utmost priority.